Here's a freebie for those authors who still have an active Nook Press account. I just came away from the Bublish table in the innovation zone here at BEA 2015. It hasn't been widely announced, but Bublish was pleased to share the news that they had signed a promotional deal with Barnes & Noble. Authors who distribute books through Nook Press can now sign up for a two month free trial of Bubish's platform (everyone else can get a one month free trial). Bublish offers an author-centric marketing platform, with a free tier and a paid tier which costs $99 a year. The free tier is fairly basic, and the paid tier enables authors to set up author profiles and create "book bubbles" for each of their titles. A book bubble is Bublish's name the the promotional page for a book. Authors make each book bubble by uploading an excerpt of their book, adding links to where it can be bought, and (if they like) expanding on the excerpt with a background explanation. You can find other examples on Twitter. 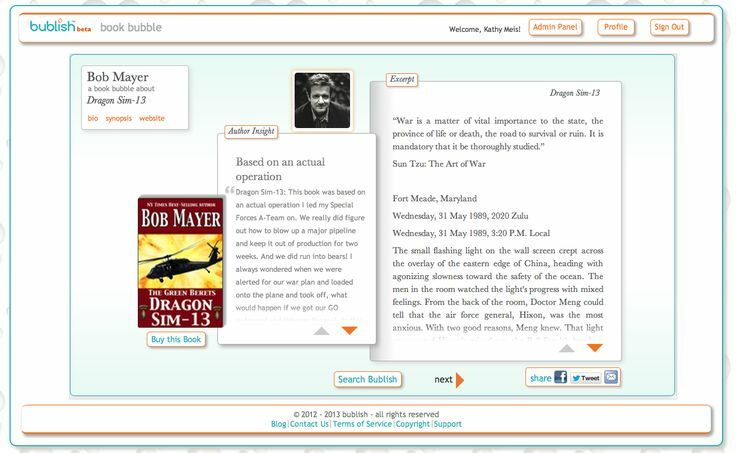 In a way, Bublish combines elements of an author's site with easily shareable links, a clean layout, and analytics. Oh, yes, Authors can track how reader find each book bubble,and how many click through to the bookstores. This is perhaps the one Bublish feature which I think is worth paying for; if not for the analytics I would recommend that an author set up this page on their site (where Google Analytics can be used to perform similar tricks), or perhaps on GoodReads (where readers congregate).